This paper discusses the potential of technology-mediated forms of L2 strategy instruction (SI) to not only facilitate SI but to enhance evaluation of SI interventions and L2 strategy research more generally. It uses results from a recent empirical study to show how computer-based forms of SI may offer remedies for problematic features of evaluation, including access to process data showing how learners actually perform strategy-related tasks, the timing and frequency of collection of learner perception data, and most importantly, data about task perception and meta-cognitive monitoring, which can position L2 strategies within frameworks for self-regulated learning. The underlying premise of this article is the need to revitalize the field of L2 learner strategies with new methods for evaluation and research that can better capture the complex nature of L2 strategy use. 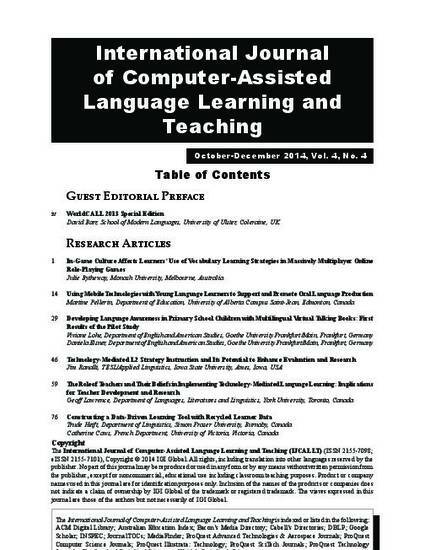 This is an article from International Journal of Computer-Assisted Language Learning and Teaching 4 (2014): 46. Posted with permission.